Huntington Beach can be found around Orange County in Southern California. It's known for its expansively long beaches, white sands and excellent surfing waves due to the land's orientation with the ocean current. Among all the qualities Huntington beach has, it's waves are top-notch, giving Orange County the nickname, "Surf City." There are a lot of things you can do around Huntington Beach. So much that you may need to book a place for more than a week to enjoy them. So, what are the things you can do in Surf City? Located on Pacific Coast Highway, between the ends of the 9th street and 7th street is the famous Dog Beach. It's basically an area where beachgoers with their canine buddies go to enjoy. It's perfect for people with dogs or people who love to go people and animal watching. Clustered here are all manner of small shops made for both man and dog, with is good in case you want to give your buddy a treat but you forgot it in the house. However, this is not a place to go if you want to enjoy a nice quiet time on the beach. This is an active, fun place for dogs, where they are allowed to go unleashed, play in the sand, and establish connections with others of their kind. Expect what you'd normally expect in areas with lots of dogs. If you're bringing your dog, always pick up after them, and it's generally advised not to go barefoot in the sand. They are open from 6 AM to 10 PM, open every day, even during holidays. There are other beaches along the long coastline, but this one is among the most popular among the denizens of Orange County. This is where you can go to do every recreation you can do along the shore. The sands are perfect for making firepits, the waves are tame enough yet vigorous enough that you’ll really feel the seashore experience. From here you can watch the surfers ride the waves this beach is famous for, and be among them. It's located at 21601 Pacific Coast Highway, which opens and closes at 9 AM to 5 PM respectively. Expect a lot of people closer to the weekend and during holidays. It’s one thing to see them in media, another to see them in real. There are several kinds of whale watching tours available, from those that pick you up from select hotels and drive around the beaches for that perfect spot, to boat tours that get you in the closest watching distance. Seeing them breach from the water and slam back to the ocean is simply awe-inspiring. The tours also include a visit to the museums, where you can get snippets and tastes of Orange County’s rich history. The pit stops between the trips land you to Main Street, where you can enjoy the many restaurants that line the sidewalks. Some of them have seafood so fresh, they were caught just this morning. This isn't called Surf City just because of a song. The waves break at the beach and the bottom of it is forgiving sand, making it ideal for beginners. You don't have to swim that far from the shore to get rideable waves, making it both safer and efficient. One thing to note is that the waves break pretty quickly, but at least wiping out closer to the shallow sands is better. If you are interested in learning how to surf, there are multiple surfing schools all around Huntington Beach. They are easy to spot, as you would see aspiring surfers train on the beach with their coaches. Had an amazing time at Huntington Beach? Buy a memento from Carved Lake Art's collection of custom topographical wood art. 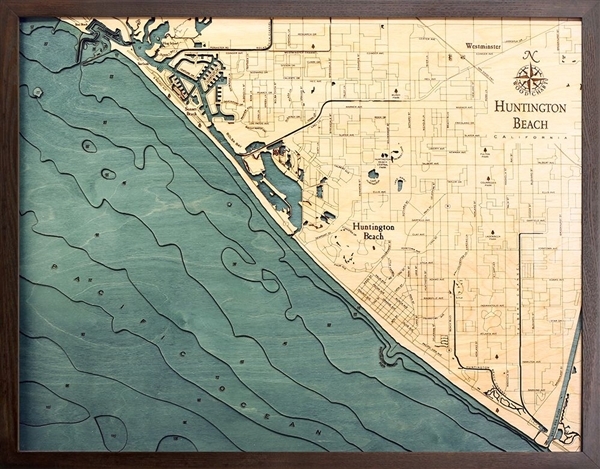 Check out Huntington Beach 3D Nautical Wood Art.